Each quarter we get the barrage of earnings announcements and go through all the earnings figures of each company. Earnings announcements can cause wide swings in stock prices. Positive earnings events can send a stock into a gap up in price and conversely negative or disappointing earnings can result in a stock price sell off. The question then can be asked, "Is there a way to take advantage of these swings in stock price as a result of an earnings announcement?" The advent of weekly options has made it easier to play earnings announcements. 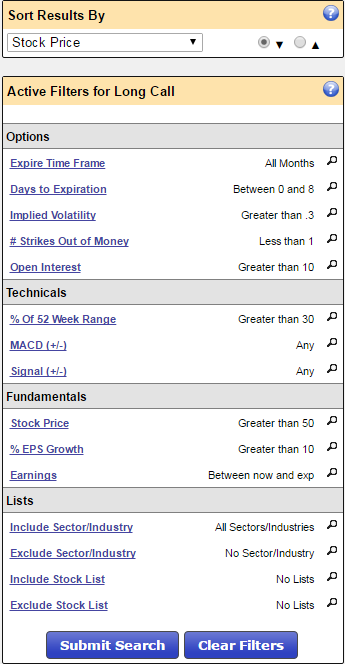 Options have a time value depending on how much time there is to expiration of the option. By using very short time frames for option speculation, this time value can be made very small. Since we know when earnings will be announced and the price reaction to the announcement happens over a very short time, weekly options can be deployed inexpensively by taking advantage for a minimal time value and cost. The concept is to buy an option, just before the earnings announcement, that will expire at the end of the week after the announcement. Since the reaction to an earnings announcement takes only a day or two the holding period for the option can be very short with almost zero time decay in the option price. The entire option price change will be dominated by the reaction to the earnings announcement. To further reduce the cost of the investment the option should be purchased slightly out-of-the-money (OTM). Before we go into the detailed steps and stock selection parameters for this strategy let us take a quick look at a recent example. Facebook (FB) had an earnings announcement at the close on January 27, 2016 and the stock vaulted from $94.45 to $109.11 +14.66 the day after earnings were announced. If this pattern were to repeat, the upcoming earnings announcement at the close of April 27, 2016 might be a candidate for this strategy. On April 27th FB stock was at around $108 and the 29-Apr 110.00 call option was selling for about $3.35. On the 28th the day after earnings were announced, FB jumped to $116.73 up $7.83 and the 29-Apr 110.00 call option had a range of $6.29 to $10.75 and closed at $6.70. The close represented a 100% gain in the option price and the high for the day was over 200%. This option expired the next day at $7.60. Caution: In general there is often a rise in Implied Volatility (IV) just before earnings are announced, which is then followed by a volatility crush (return to normal levels) after the announcement. Therefore, the stock price change needs to be enough to overcome the lowering of the implied volatility and the lowering of the option premium. In the FB case, IV increased from .68 to 1.14 before the earnings announcement and then crashed to $0.50 after the announcement. Facebook (FB) from 1/15/2016 to 5/2/2016. If earnings would have disappointed, FB stock would have fallen and the option would quickly go to near zero value and expire worthless. This strategy can be applied to negative earnings and surprises with the use of weekly put options. The stock characteristics would generally be the opposite of those used for calls unless you are looking for disappointing earnings from a growth issue. 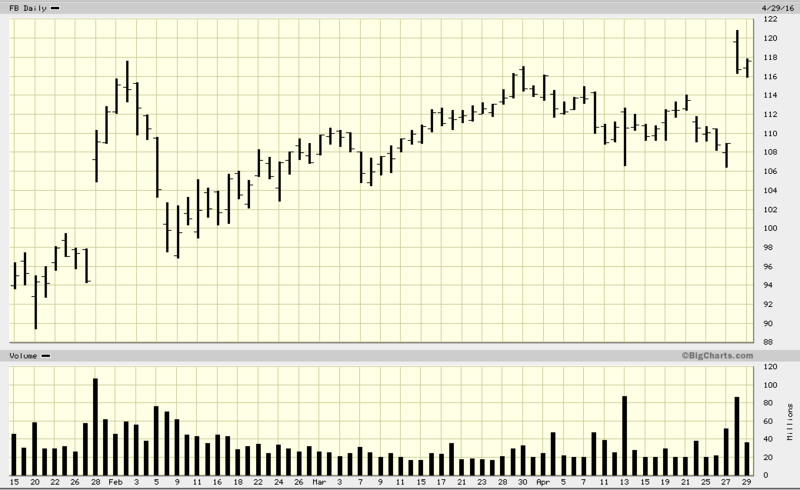 An example might be Apple Inc. (AAPL). Apple had a great run up based on record iPhone sales. But then sales growth, while still good, started to slow and their suppliers noticed decreased orders. The writing was on the wall that there might be some disappointment in the forthcoming earnings announcement on April 27, 2016. Apple stock price was even weak the week before the announcement, moving below the 20 day moving average. On the trading day before the Apple Inc. earnings announcement the stock sold for around $104 and the 29-Apr 103.00 Put was at $2.00/contract. The next day the disappointing earnings announcement took AAPL's stock price down to $96 at the open and the 29-Apr 103.00 Put hit a high over $7.00 and expired over $9.00 at expiration on the 29th. These gains were very substantial. An interesting point to note is that disappointing earnings results for popular or high flying stocks can create very wide negative moves. Speculating on negative moves can, if correct, produce much larger gains with puts than looking for positive gains using calls. This is obviously a high-risk/high-reward strategy. Long term success with this strategy requires a better than 50/50 chance of the stock movement being in your favor. The screening parameters will produce a list of companies that have earnings in the next week and the call or put that will expire at the end of the week. But back test has shown that the results cannot be successfully used by just investing in any put, call, or strangle position. About 1/3 may have a positive earnings surprise, 1/3 may have a negative surprise, and 1/3 will not have a significant change from the forecast. Therefore, one cannot just randomly pick one of the stocks to profit. Success requires some additional information to increase the odds of knowing the direction of the surprise. In playing poker, the card player looks for signs among the other players, which indicated what they might be holding. They call this a "tell". Something which tells the player what level of confidence the other players have in the cards at hand. The "tell" for Apple was the slowing of sales growth, suppliers not seeing the same level of re-orders, and the slight price weakness in the stock price before the earnings announcement. These were all indicators that there might be some disappointment in the earnings results, which is this case did foretell a decline in stock price after the earnings announcement.